Across our industry, we are challenged by increasing amounts of data arriving ever more quickly, sometimes called the “big data” issue. The classic response to vast volumes of data is to select only a sub-set and/or to approach any analysis with a ‘going in’ model – for example to pre-judge that the key correlation is between Parameter X (for example, Cost) and some other Variable Y (for example, Delay) – rather than letting the data ‘speak’. And, technically, scatter (XY) plot and regression loyalists are falling way behind those that are applying advanced analysis techniques to identify hidden signals in their data. Advanced analysis techniques like machine learning can deliver much more value in the context of problem solving, and have demonstrated their power in the ‘big data’ shale oil and gas provinces of the USA. They truly ‘let the data speak’. The key here is that we must avoid this becoming yet another (IT) technology solution looking for a problem to solve! 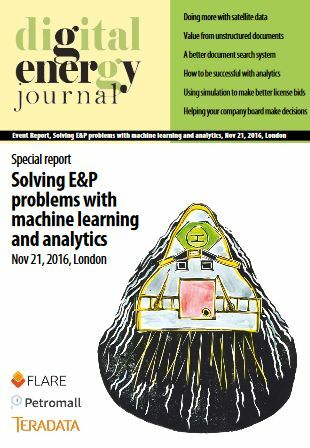 Can a new era of Earth Observation big data & analytics add real value to O&G operations? Since 2005, Flare have been developing an oil and gas industry taxonomy. The taxonomy represents what is known about the industry, and what products are produced. Flare's machine learning algorithms have been able to identify themes within existing content, and by combining this with the taxonomies, field analogues, based on different factors such as reservoir age or production problems can be discovered. I want to try machine learning, how do I get started? First it was Big Data, then analytics, and now it’s machine learning. There’s a lot of bandwagons to jump on but they can all drive real business value if implemented thoughtfully. However, there’s also a lot of “gotchas” with these activities in E&P, including the data quality, data volumes, and amount of science brought to bear. I’ll show the steps that are required to spin-up and support an analytics capability in an E&P operator, and how to implement machine learning and advanced analytics to support upstream workflows. Justin is one of the world's foremost experts in the field of computer-based simulation and a regular speaker on the application of AI, advanced analytics and simulation technology in solving complex problems. He regularly consults with the world's business, government and civic leaders on ways they can make radically better decisions. Justin studied at MIT and has worked in software development, strategic consultancy, sales and marketing for over 20 years. He is the founder of the pioneering technology company, Simudyne and a Director of ORDACH, a cyber-security SaaS solution developed as part of the Cyber London Accelerator (CyLon). Analytics impacts the oil patch! I will review how machine learning & analytics are beginning to impact the oil & gas patch - from exploration, through project development, production optimisation, preventative maintenance and decommissioning. There is one gaping hole!